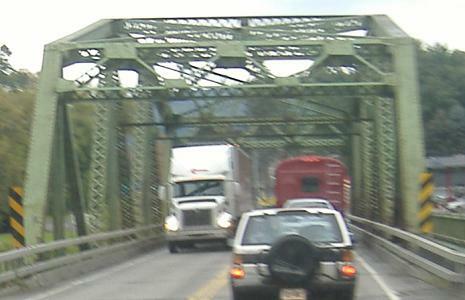 Old box-beam bridge just north of Lawrenceville, Pennsylvania, which lies in the background. It will stop taking such a beating from trucks once the US 15 freeway is completed (visit the PA page link at the bottom to see photos of the ongoing work). 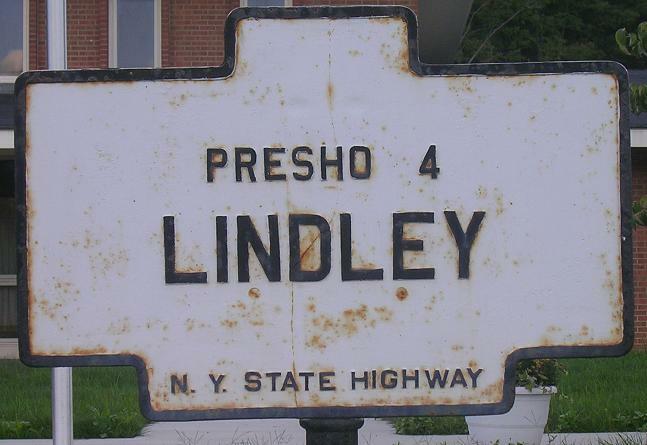 In early fall 2008, the freeway was completed into New York. I drove it before the contractor even got a chance to remove the construction barrels. It fairs seamlessly into the old road about a mile in, but the link from there to the rest of the freeway is still a few years off. NB, I'm guessing on the old US 15, courtesy John Krakoff. 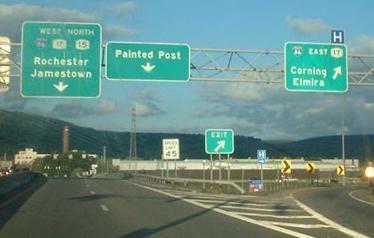 Note the NY 15 on these northbound Doug Kerr-furnished signs. Yes, this was US 15 not so long ago, but for whatever reason NY decided it didn't like the US 15 multiplex with NY 17/I-86 and I-390, so now US 15 ends here. Notice how small all the shields here are, on quite new signs. NY 15 and 17 both are about to come down and make this I-86 alone. The opposite direction, at the beginning of US 15, and the last Doug Kerr photo on this page. 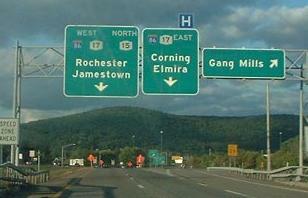 When I-86 was brought east over NY 17 in this area, this sign had to be considerably altered. I-390 is a north-south route, and its shield doesn't look any more permanent than the other two, so I can't fathom what the old message was assuming the sign was correct. 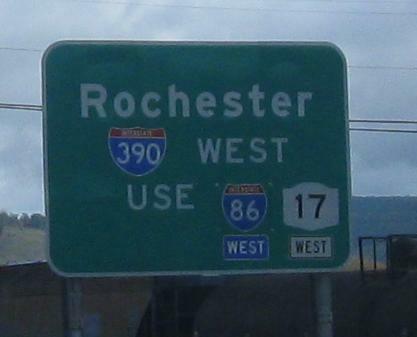 If the sign was an error, though, then I can believe the I-390 shield. 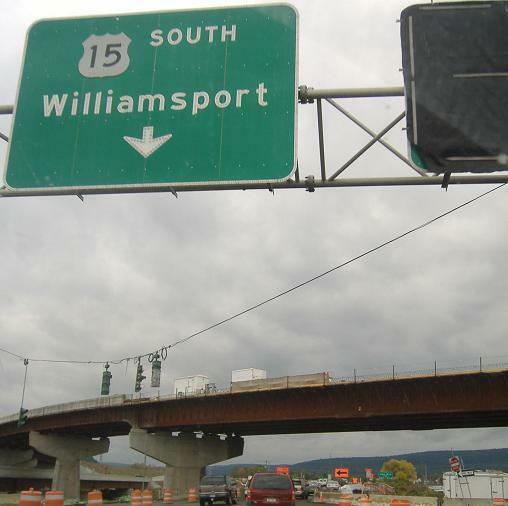 By fall 2006, as construction has progressed (and in fact has neared completion) on the new 3-Y stack interchange linking US 15 to NY 17/I-86 in a full-freeway connection, the SB-EB loop ramp here has closed. It will reopen once the interchange has opened in its final configuration. 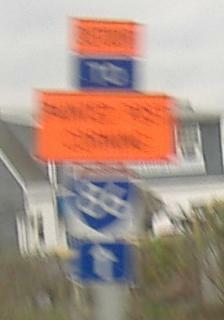 Blurry SB reminder of the wrong-way detour. Switching gears for the last few photos, this is on the ramp from NY 17/I-86 WB to US 15 (a diamond interchange with an extra ramp, as it now stands). On the left is the future WB-SB flyover, and straight ahead are the NB-WB flyover (top) and EB-SB ramp (actually farther in the background). Machinery atop the WB-SB ramp. Those are NY 15 (North), NY 17, and I-86 (both West) shields on the NB-WB flyover. 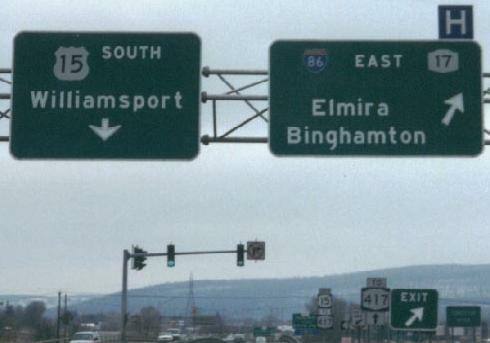 That ramp opens four days from the time I'm typing this, or 16 days after the Elmira Meet. 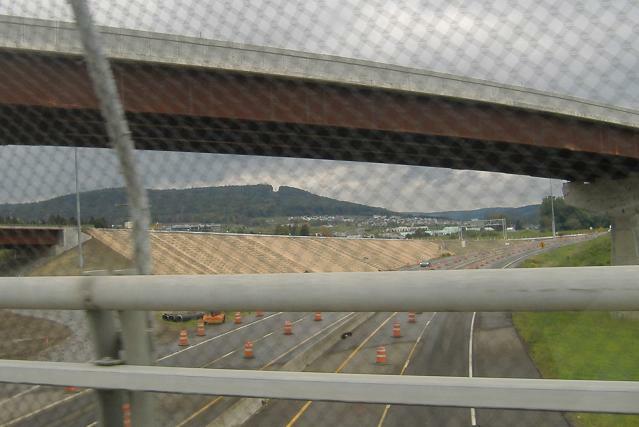 Strange slope treatment for the EB-SB ramp, and apparently median replacement on NY 17/I-86 is part of the project. The new assembly on the new NB-WB ramp in October 2008. 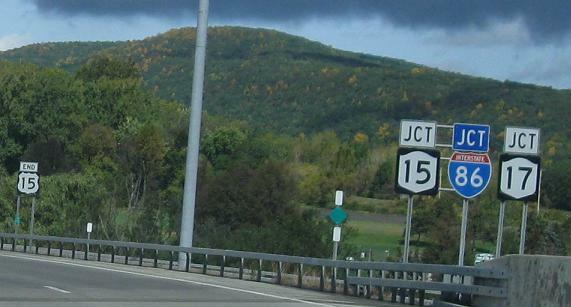 The JCT shields belonged half a mile earlier, and the inclusion of NY 15 is questionable since it's just a continuation of the number.